Memory pockets can exist in an amnestic period during the days after a brain injury. The process of remembering emotionally charged memories is slightly different than that of remembering adrenaline amplified memory, but there is significant overlap. The reason for the overlap is that those moments when adrenaline is coursing through your veins may also be the moments your emotions are most taught. A memory pocket, an island of memory, in a sea of amnesia may be due to an interplay between the hippocampus and amygdala in memory. 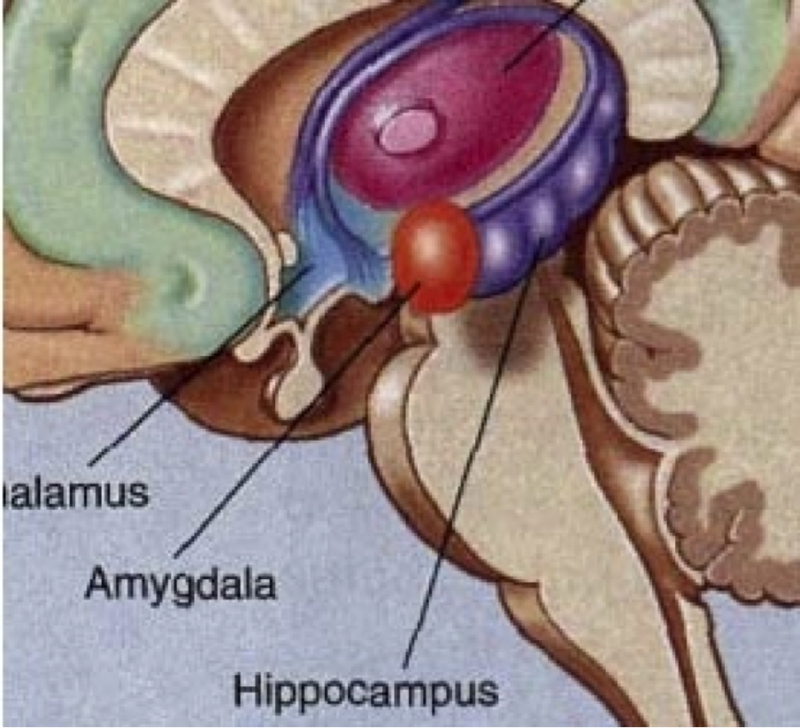 The hippocampus is purple, the amygdala is red in this illustration. The reason I distinguish between the two is the role of the amygdala in memory, and the way in which it interacts with the hippocampus. Both the amygdala and the hippocampus are limbic system structures, tucked within the temporal lobes, in near proximity to each other. They both play a role in memory pockets. The hippocampus, is a very significant part of the brain’s memory saving feature. But it is hippocampus is not so much a button, as an anteroom. In this anteroom, the visiting memories are constantly refreshed, while the cortical circuits of the brain decide what and where to store them. It is believed that the hippocampus has extraordinary capacity to change its memory circuits, in contrast to the cortical structures where they change more slowly. But because the memory is so changeable ”neuroplastic” it is believed that memory can only be retained for short periods in the hippocampus. In contrast, the less neuroplastic cortical areas, change makeup far more slowly, but require a more substantive process to encode. It is in this way that the brain sorts what it should save, from all of the data that flows into it. Even though the hippocampus is not the place that long term memory is stored, it is the key gateway for that information to reach the brain. Without a hippocampus, new memories cannot form. Take for example the case of HM. HM had bilateral hippocampal surgery in his late teens. After such surgery, he had virtually no memory encoding. He could not remember that his father was dead. He could find his way around and could take walks on his own, something which he could access from his long term memory. Yet when he and his mother relocated to a different city, the only thing he could find reliably, in a topographic sense, was the bathroom. The amygdala is the primary location of our primitive brain’s flight for life center. It is what is left over from our time among great predators, where our inability to react without thinking, assured our survival as a species. It also appears to be a major component in anxiety disorders and plays a significant role in keeping us hyper vigilant when in danger. The soldier without an active amygdala will not survive in combat. Yet, the ability to readjust to civilian life may be permanently impaired by this continued hypervigilance. This is believed to be one of the primary causes to the combat based PTSD. For more on combat related brain injury and PTSD, click here. While the full extent of the interaction between the hippocampus and the amygdala is still not clear, the amygdala does contribute to memory encoding in measurable ways. The case of a survivor of a motor vehicle fire is an excellent example of the illustration of the island of memory, even though it is not clear whether the island of memory exists because of the involvement of adrenaline or the amygdala. Likely it was both. DL was a 53 year old mother, who was in a motor vehicle accident with her son. Both she and her son were pulled from the burning vehicle and rescued just before it exploded. She had a three minute LOC and came to with her vehicle and her son badly burned. She suffered burns in the fire. She stood by and watched as her son was intubated and put in an air ambulance because he was a “life and death” patient. DL remembers these events vividly. Indeed, two years after the accident she still had intrusive thoughts and flashbacks about these events (i.e., PTSD). By the time that she was attended to by EMTs (her son had already been flown away), she was described as being confused. She only had fragmentary memories of the emergency room and her treatment for burns. Because she had no marks on her head and did not complain of TBI, she was given only a cursory neurological workup. She was discharged to home that same day. Despite these terrifying memories, she had no recollection for the succeeding 4 to 6 days as evidenced be her failing to recall visits by relatives (even if they left for only a few minutes). Under conditions of extreme stress and to some degree terror, she was able to form memories that she retained, but when the stressor was removed and she was able to calm down, her amnesia started and stayed for about a week. DL clearly had a memory pocket, despite a long period of amnesia. The diagnostic challenge is that the probability of a memory pocket showing up around the time of the accident is great. Thus, if the ER personnel only ask about the events of the accident, they may completely miss quite profound amnesia, because of the memory pocket. The identification of the PTSD diagnosis dates to studies that were done on Vietnam combat veterans. A subject of veteransbraininjury.com is the overlap between trauma and PTSD. We also believe that many organically caused disorders have been mislabeled with this emotionally based diagnosis. Yet the distinction between organic and emotional based cause is a fuzzy line. The understanding of either condition may not be aided by separating the shades of organic versus psychiatric color on each side of that line.